You are driving down the freeway and you see a car has crashed into a concrete barrier. A few cars have stopped and a crowd has gathered but you don’t see any emergency services. You decide to stop to see if you can help. A bystander tells you that emergency services are 5 minutes away, another bystander has placed their car with its hazard lights on to block off traffic and make the area safe. 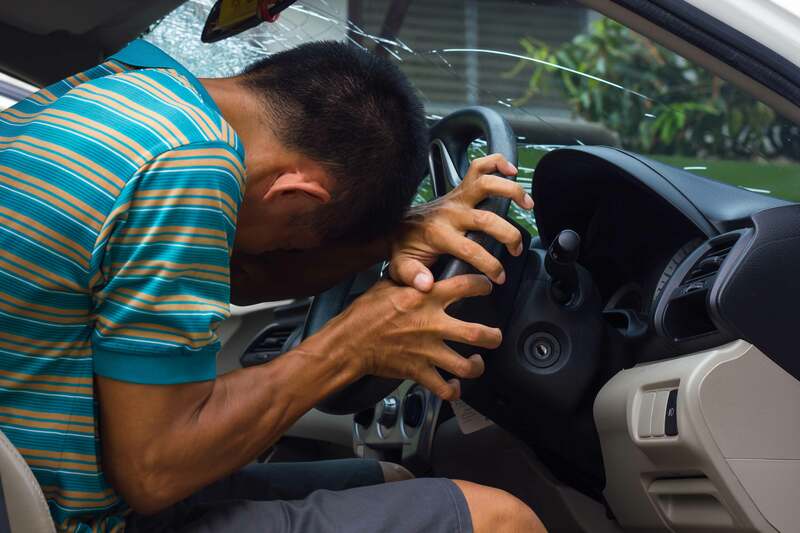 In the car you see a man with his head slumped forward on the steering wheel, he is not moving and you hear him gasping in air with every breath he takes. The bystanders are looking at him but not doing anything. What would you do until the ambulance arrives? Option 1 – Do nothing, his breathing is abnormal but he’s still breathing. Monitor him until emergency services arrive. You don’t want to injure his spine if you don’t have to. Option 2 – Get into the back seat, reach around to the driver and provide head tilt to open his airway more. Even if this means potentially injuring his spine. If you answered Option 2 – Get into the back seat, reach around to the driver and provide head tilt to open his airway more then in this situation you would be correct! Road traffic accidents are usually very complex with a lot going on. If you have attended one of my classes then you would know what my first rule of first aid is… “keep yourself safe first!“. For a lot of people that answered Option 1 because you were concerned for your own safety please know that you are not wrong. In any first aid situation you must assess your surroundings first and if you deem it to be not safe then maybe the best thing you can do is call 000 and monitor the situation, knowing that help is on the way. Please don’t become another statistic or the next casualty by not assessing for dangers. However, in this scenario we are assuming that the area is safe from oncoming cars and the car that the injured person is in. Our issue that we are faced with is managing an unconscious casualty’s airway when they have been involved in a road vehicle accident. When assessing an airway we need to ask ourselves Is the breathing normal? Listen to yourself breathing, it may be very quiet and you may not hear a lot of sound. Do me a favour and place your right hand on your chest, gently breath in and out and watch your hand move up and down. There is little movement of the shoulders and breathing is almost effortless. This is described as normal breathing. If the unconscious casualty in a road vehicle accident is breathing normally then their airway is open and they can get enough air into their lungs. All we need to do as first aid responders is monitor, keep the person safe and wait for emergency services. We only move the casualty if their breathing becomes abnormal or stops. This is the scenario that we are faced with. Our unconscious casualty is breathing abnormally, he is gasping in air with every breath he takes. Lets do another experiment. Try and touch your chin to you chest and take a few deep breaths in. Is it difficult to breath? Can you hear the labored breathing? This is what our casualty is experiencing. Now return your head to a natural upright position and take a few breaths in. You can now breathe normally. This is what we are aiming to accomplish with the head tilt. When a person is breathing abnormally they are struggling to keep their airway open, they exert a lot of energy to keep breathing and may stop at any moment. 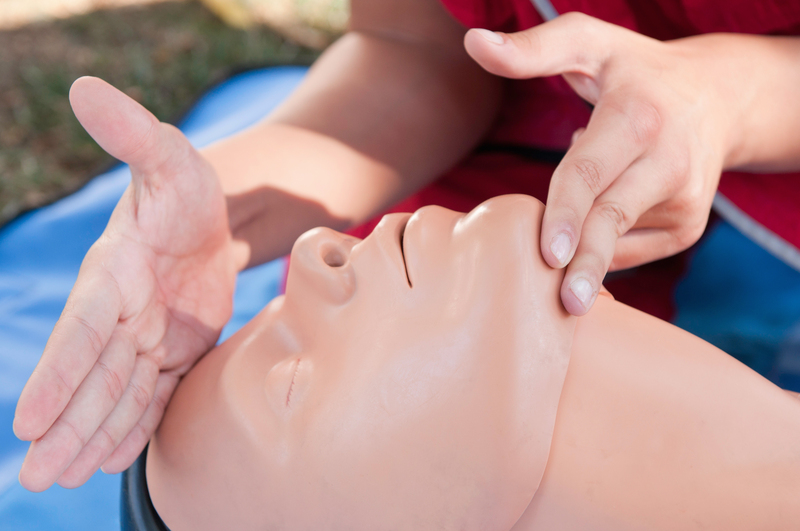 If the unconscious casualty in a road vehicle accident is breathing abnormally and it is safe to render assistance a simple head tilt to open up an airway could be enough to save their life. At this point in my class I usually have a few people ask the question, “What about the spine? Couldn’t I do damage to it by moving him?” The short answer is… well yes… you could do damage to the spine. But the primary issue is that he can’t breathe. Airway always has priority over the spine. His body is not receiving enough oxygen and his heart and brain tissues can’t survive without oxygen so we need to do something so that he can live. The rest may be fixable but if he’s not breathing normally then he won’t be breathing for long with or without an intact spine. Performing a head tilt to an unconscious casualty in the drivers seat or passenger seat is much easier if you can get into the back seat and sit yourself behind your casualty, it puts less stress on your back and means that you are not holding an awkward position for a long time. Again, I stress, only if it is safe to do so. Practice on yourself, use your pointer fingers and feel your jaw bone under your chin, you are feeling for the hard bone not the soft tissue. Using your first two fingers try putting a little pressure on this spot and see if you feel your own head lifting up. Remember you are feeling and using the jaw bone and not the soft tissue. We don’t need to tilt the head much to open an airway. We are looking for an upright position, with the head slightly flexed back (not too much). You know you are in the right spot when you hear the gasping for breath decrease and turn into normal breathing. If our unconscious casualty is now breathing normally all we need to do is hold the position and continue to monitor them until the ambulance arrive. As always, if our casualty stops breathing or we can’t fix the abnormal breathing then they require CPR. CPR cannot be preformed effectively while the casualty is in a seated position, so we need to pull them out of the car (hopefully with some bystander’s help) lower them onto the ground and perform CPR. When it comes to road vehicle accidents it is never a black and white scenario. We must always use our judgement if it is safe to assist the person and insure that we do not become another casualty. For airway management, if the unconscious casualty is breathing normally we can monitor and wait for assistance. If the unconscious casualty is breathing abnormally then we can lift their jaw and provide a head tilt to open their airway and allow them to breath normally. If the unconscious casualty continues to breathe abnormally or stops breathing then we need to perform CPR and get them onto a firm hard surface.